Geoffrey Banks, Ph.D., Nuventra’s President and CEO, was featured on Spectrum News’ In Focus show which aired on Sunday, December 3. In Focus is a new, 30-minute public affairs program hosted by Senior Political Reporter and anchor Loretta Boniti. 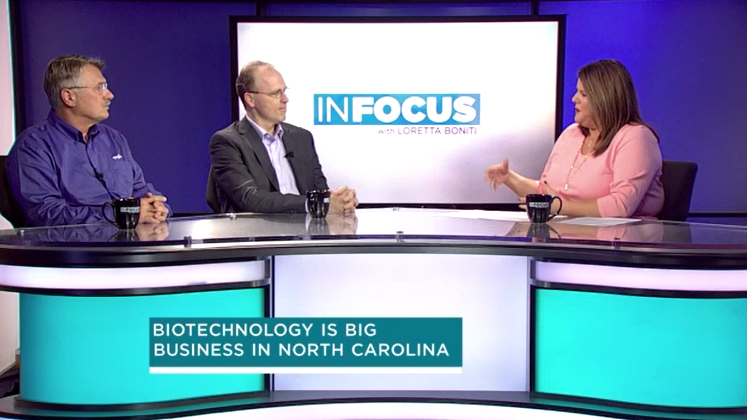 This week’s episode focuses on the growing biotech industry in North Carolina, which had an $86 billion-dollar impact on the state in 2016 alone. In the interview, Dr. Banks explained how Nuventra was founded by serving an un-met need he saw in the biotech industry, both locally, nationally and internationally. Both Dr. Banks and Dirk Benson, Head of Seeds Product Development at Syngenta, mentioned the strength of our local universities and the talent emerging right here in the Triangle.